Are you yearning to get a little more out of your next vacation than memories of a hotel room and touristy t-shirts? Read several excerpts written by several Hideaways Staff members about vacations they?ve taken where learning was the main objective. Live the life of a Maine lobsterman on a lobstering excursion and indulge on your fresh catch at the end of the day. 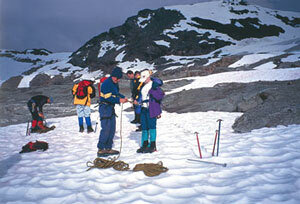 Get together a rugged group for some adventure travel and heli-hike among snow-capped mountains with a Canadian mountaineering tour group. Travel to Europe for a day of falconry and experience what the Kings and Knights did back in the day while hunting with birds of prey. Travel to Utah (without your skis) and learn how to make jewelry from red-horned coral. If a cruise vacation is more your style, opt for a cruise line that offers wine-tasting cruises or on-board cooking schools. Read the staff's entertaining experiences as they traveled the world in search of knowledge.